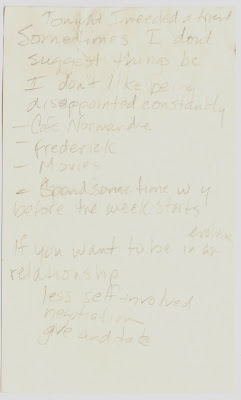 Papergreat: "If you want to be in an evolving relationship..."
"If you want to be in an evolving relationship..."
Joan found this slip of paper tucked away inside a book she was looking through earlier this year. But depressing notes deserve to be shared, too. Right? I'm guessing that Cafe Normandie and Frederick are both Maryland references. There's a Cafe Normandie in Annapolis. And Annapolis and Frederick are less than 90 minutes apart. 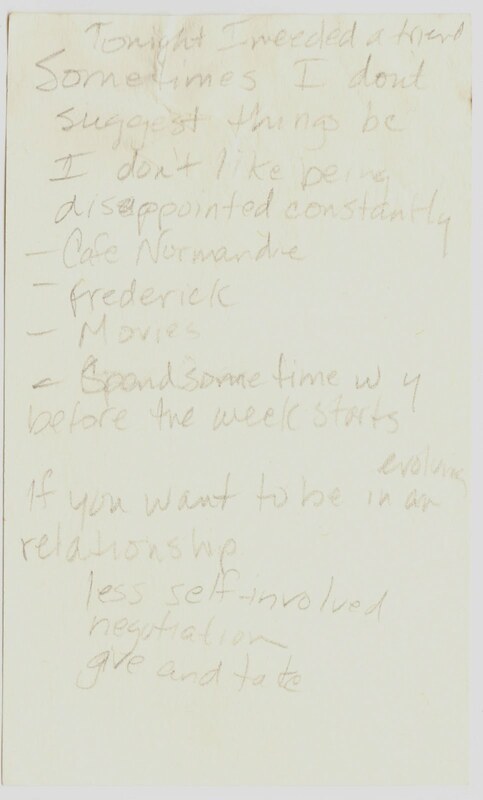 Perhaps those were two possibilities — along with the movies — for this anonymous note-writer to take his or her significant other. I hope he or she found that friend.